This IS the new Chelsea away kit for the 2011/2012 Premier League season. The Samsung (kit sponsors) and adidas logos are both white in colour; as are the adidas stripes on the shoulders. 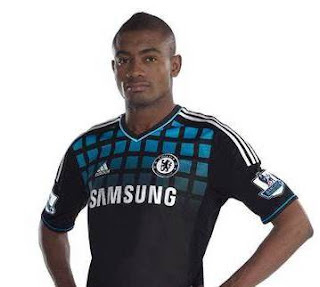 The shirt contains turquoise squares in a netted pattern on a black background, as can be seen from the photo - interestingly modelled by Salomon Kalou. The Blues will wear their new away shirt for the first time in the pre-season friendly against Hong Kong champions Kitchee in the Barclays Asia Trophy on July 27, 2011.